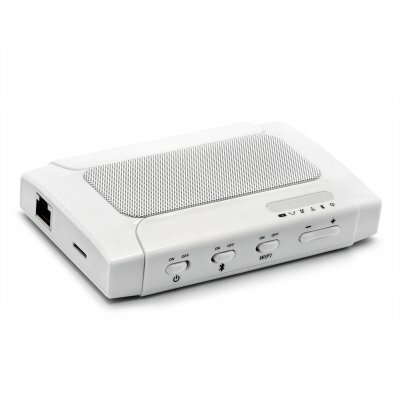 Successfully Added Bluetooth Wireless Speaker + Wireless b/g/n AP - Micro SD Card Reader, Power Bank to your Shopping Cart. Bluetooth Wireless Speaker that has a micro SD card reader and can be used as a wireless AP as well as a power bank for the next step in multifunction gadgets. If you need a all in one gadget that does everything, this speaker, WiFi AP, MP3 player, and power bank all in one combo is the perfect thing for you. First off, this compact sized wireless speaker connects to your phone, tablet or computer's media via Bluetooth outputting your media on its high end speakers. Next, simply connect a LAN wire and you get the ability to create a Wi-Fi b/g/n access point to surf the internet at the same time. Next, the multifunction speaker takes Micro SD cards with MP3 music so you can just play music direct just like a MP3 player. Also while all of this is going on, you can charge your portable electronics such as your phone or tablet using the built in 2500mAH battery bank with its 5 accompanied connection heads. Imagine, all you have to do is set this device on your desk, and it will do the job of 4 different high end electronic gadgets for a fraction of the price of them all put together. A conveniently created gadget that does more than just play music through its speaker. This product is in stock and can be dispatched within 24 hours of ordering with a 12 month warranty. Brought to you by the leaders in wholesale electronics and cell phone accessories, Chinavasion. 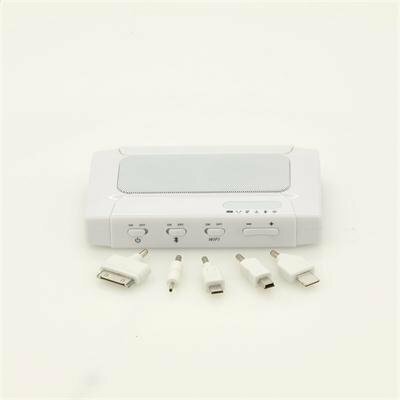 The unit is powered buy attaching the Mini USB attachment to the mini USB port and then connecting the included charging cable with a male USB head. WiFi password for the Access Point is 6666.